The star of "Sons of Anarchy" just got an invitation to get his face bashed in by a real-life member of a motorcycle club who has a SERIOUS beef with the creator of the show. 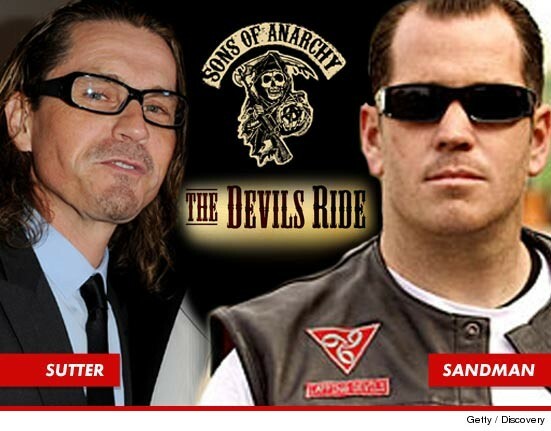 It's all over some pretty incendiary comments made by "Sons" creator Kurt Sutter -- aimed at the stars of "The Devils Ride" ... a Discovery Channel reality show about the Laffing Devils motorcycle club in San Diego. Sutter's tweet read, "Watched Devils Ride. Probably get in trouble for saying this, but I'm pretty sure my SOA actors could kick the sh*t out of this 'real' MC." Obviously, the Devils weren't happy about the statement. TMZ spoke with a guy named Sandman -- a very scary member of the club -- who tells us, "I am concerned that Kurt's creative mind is stuck in make-believe land with his recent comment on twitter." Sandman adds, "Here's a reality check for ya Kurt ... I am sending a personal invitation to your pretty faced Kurt Cobain look-alike star Jax to come down to San Diego and prove your point." Yes, Sandman just challenged Charlie Hunnam to a fight. And he ain't done yet ... Sandman continues, "And tell him to wear those shiny white kicks too. I hope he's a size 11, I could use some new shoes." Sandman even mentioned Sutter's wife -- actress Katey Sagal -- saying, "I am a big 'Married with Children' fan, can you have Peg send me an autographed picture? I would appreciate it." We called Sutter for comment -- so far, no response.